The playground is open year-round, but the café and mini-golf course are only open in the summer, from May till September. 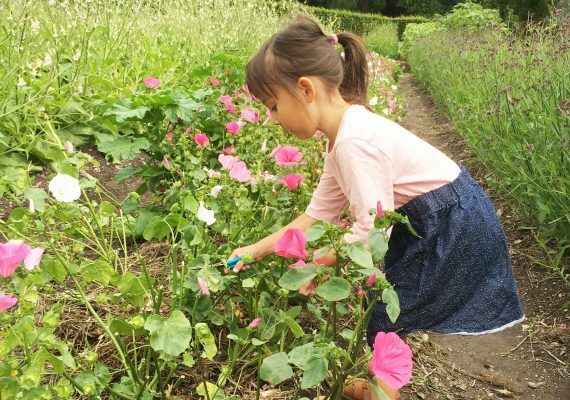 This itinerary is intended for the summer months, between May and September, in order to be able to visit the café and mini-golf course, which are only open seasonally. And, even though the playground is open year-round, it is best enjoyed during warmer weather, when it is easier (and safer) to play on some of the higher structures. 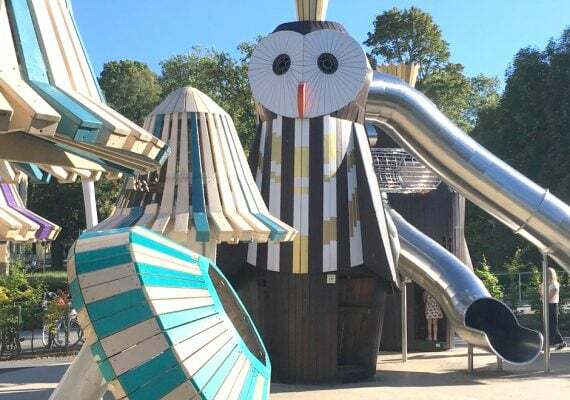 Leave the hustle and bustle of the tourist spots and head to Uggleparken (The Owl Park), the most beautiful playground in Stockholm. This itinerary takes you off the tourist track, out of the main city centre and into the quiet residential neighbourhood of Kristineberg. Here, you will discover an incredibly unique and beautifully designed playground. Next, follow this up with a fun game of mini-golf at Golfbaren Kristineberg. Lastly, grab a bite to eat or some ice cream at the adjoining outdoor restaurant. 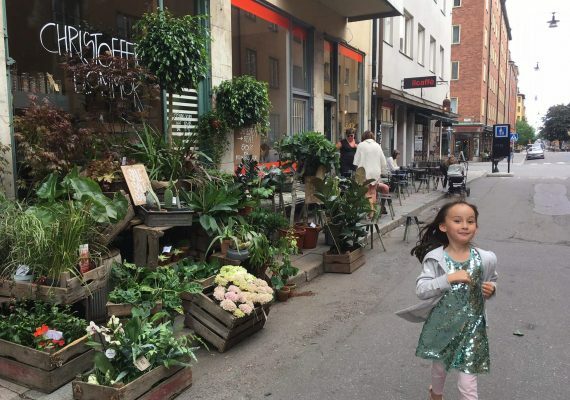 It's a great Sweden family vacation itinerary that offers a break from sightseeing. 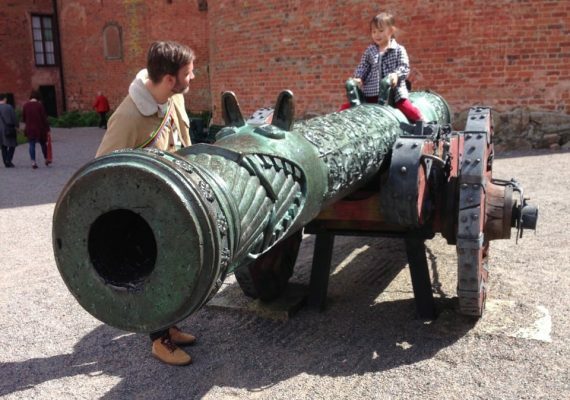 All in all, a fun day of play away from the usual tourist haunts in Stockholm with kids. Uggleparken is one of the most unique playgrounds in Stockholm, and perhaps the world. The park is a fantasy world of giant owls, beetles, mushrooms and flowers, all of which are constructed entirely out of wood and designed to be climbed and explored from both the inside and out. It is visually stunning while providing thoroughly engaging, challenging and creative play spaces for kids. Children will love climbing ladders to the tops of towering tulips, looking out at the world from the mouths of wooden beetles and, of course, the multiple slides inside the giant owls. DIRECTIONS Take the subway (green line) to Kristineberg, which is seven stops from Central Station. Exit the station and cross the street, then walk straight down Nordenflychtsvägen (you can take the pedestrian path through the park) for about two minutes. When you see the large wooden owl structures, you have arrived. TIP This playground is best suited for kids from ages 3 and up, but some of the larger, higher structures are recommended for kids over the ages of 5 or 6. There are signs with age recommendations for the more challenging areas, but parents should, of course, use their own discretion in deciding what's appropriate for their child's abilities. This mini-golf course is considered the nicest in Stockholm, due to its extremely well-kept grounds and really pleasant outdoor bar and restaurant. The mini-golf course is very kid-friendly. But, if your children aren't old enough or interested, it's still a great place to grab lunch, a drink or some ice cream. I really appreciated the fact that it's easy to play a few holes, take a little break in the café and then resume your game. Which is the only way to get through 18 holes with a 6-year-old at a relaxed and fun pace! The grounds are landscaped with many plants and flowers and are surrounded by leafy green trees from the neighbouring park. The view makes it a really pleasant environment on a summer's day. DIRECTIONS From Uggleparken, head back down the same path, Nordenflychtsvägen, and you will see Golfbaren to your left, just across the street from the subway station. TIP The restaurant doesn't have any indoor seating, so this is only appropriate for warm, sunny days. It can get very busy in the late afternoon/early evening with the after-work crowd. So, as with any popular spot, the best time to visit with kids is earlier in the day and on a weekday, if possible.